​real but told through a fictional character." ​After their last run in, Nick Grant believes his nemesis, Toshio Miyazaki, is dead. Determined to leave the spy games behind, Nick starts a new life as a Naval Aviation Cadet. 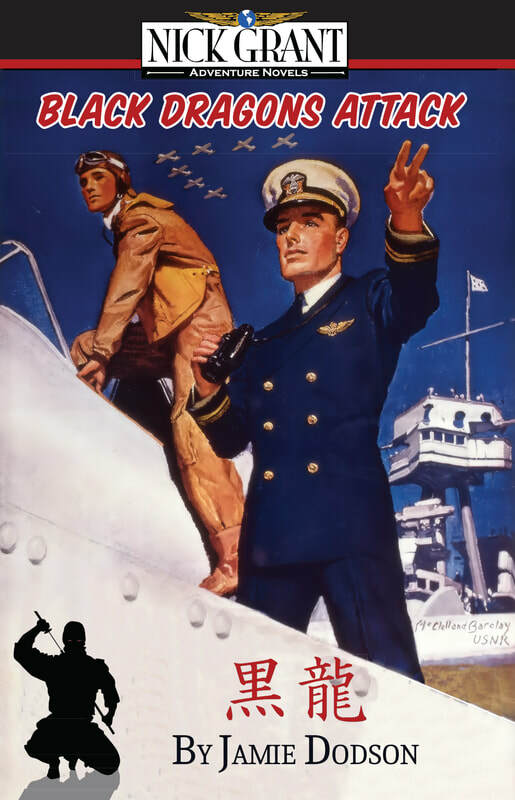 During training, famous aviator and movie producer, Howard Hughes, lures Midshipman Grant into a mock dogfight. Afterwards Hughes offers Nick a pilot job. Nick’s college dreams stand in the way, and he turns Hughes down. However, their paths cross again in an unexpected way. In 1936 the Black Dragons working for the Japanese Intelligence Service, remain active in California and have a new partner, the Third Reich. Agents from both countries team up in their most audacious plan yet — steal the Hughes H-1 racer. Their plan — use the cutting edge technology to develop the worlds’ most advanced fighter aircraft. ​When the Black Dragons​ attack, it’s up to Nick and friends to turn the tables, retrieve the stolen goods and fabled katana. Join Nick Grant, Nancy Tanaka, and Leilani Porta in their latest adventure.